The next huge shopping fever is knocking on the door already. Yes, it's time for St. Valentine’s Day. So what is “the cost of love”? According to the National Retail Federation, Americans will have spent approximately over $20 billion for Valentine’s Day this year. And since more and more customers are buying online, as it is faster, easier and, let's face it cheaper, e-shops are once again facing one “simple” task. Keep your website up and make sure it is faster than the competitors'. High downtime and response time mean disappointed customers – regardless of how great your Valentine’s gifts are. As usual, we are going to monitor 7 of the most popular online retailers for Valentine’s day gifts. In the previous years, many of them were close to 100% availability and excellent performance, but let’s not forget that online customers become more pretentious regarding the websites’ performance. Thus, some websites might not be able to bear the heavy traffic and/or keep low response time just as they did in the previous years. So why take any chances? Do the right thing and monitor your website. 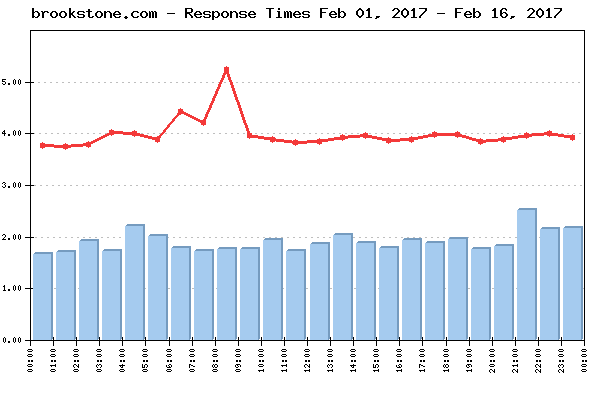 The daily Average Response time from all monitored websites was 3.666 sec. The Average Response time as measured from the US East Coast (Washington DC) was: 3.862 sec. The Average Response time as measured from the US West Coast (San Francisco, CA) was: 3.709 sec. The Average Response time as measured from the US Central was (Chicago, IL): 3.428 sec. The Best Response time measured from US East Coast (Washington DC): 1.256 sec. The Best Response time measured from US West Coast (San Francisco, CA): 1.719 sec. The Best Response time measured from US Central was (Chicago, IL): 1.331 sec. 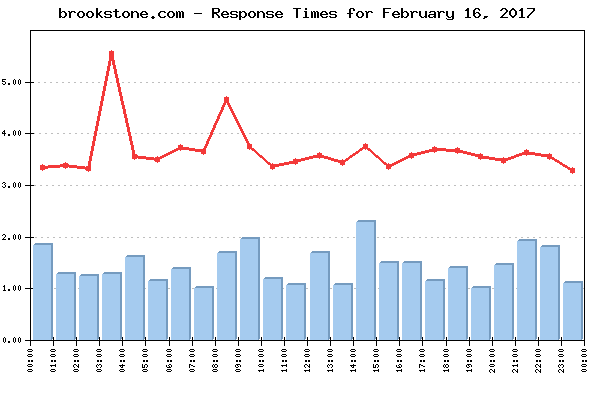 The typical shopping transaction took the least time for brookstone.com visitors - 1.435 sec., while the visitors of ftd.com had to be the most patient, as the shopping transaction there took in average of 5.691 sec. 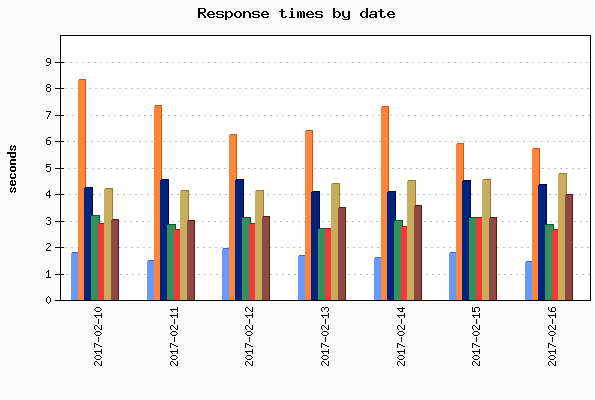 Four of the monitored websites delivered above-the-average response times for their transactions, while three of them demonstrated below-the-average daily performance. The daily average uptime for the entire Group was 98.4%. Four websites' availability was above the average, while three sites dragged the average down with below-the-average availability. No events of particular importance or possible negative impact on the online visitors' interaction with the Websites included into the 2017 Valentine's day report were detected during the reported period, and according to WebSitePulse, the Group delivered the expected levels of End-User experience and Customer satisfaction. The 2017 Valentine's Day Reports reflect a complete fullpage web transaction, representative for the End Users' interactions with a website. The reporting period covers the dates between February 1st and February 17th, 2017. Performance and availability measurements are made for a typical multi-step web transaction at 15 minute monitoring interval, every day 24/7. The WebSitePulse application monitoring service is used to collect data and to create the reports.